Play Day Saturday are clothes for taking your kids to the park, running errands, talking your dog for a walk, shopping, picnicking, traveling, going to a museum or a zoo—out and about or home having fun clothes. These are the clothes you often live the best parts of your life in! The POW (Piece of the Week) the cabi Spring 2016 Margherita Dress. This look says outdoor craft fair, festival, farmer’s market, antiquing, or going to a museum to me. It’s cool, comfortable, and versatile. It’s something you can easily dress up or down, and the addition of the cardigan makes it good for changing temperatures. 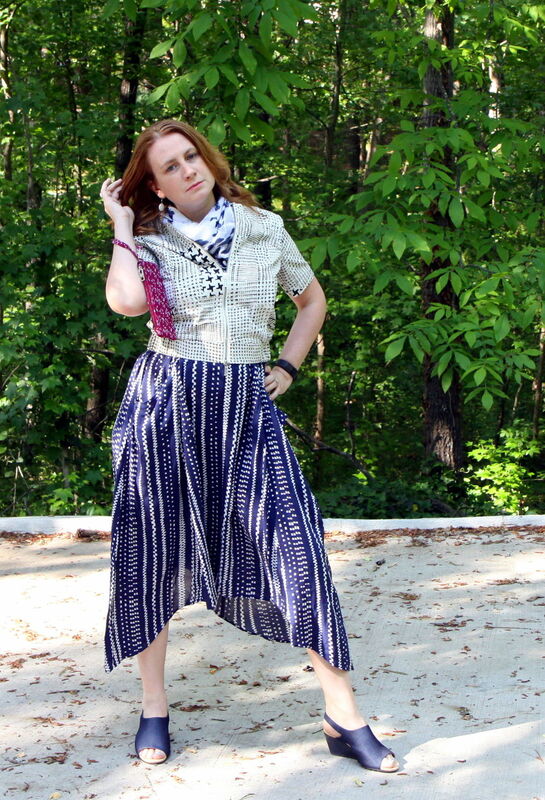 This outfit also has a put-together look, but one that is really easy to put together! The mixed whites cardigan, cream purse, taupe shoes, and white belt, give it a more polished and complete look because of all the white pieces. It creates a good consistency. The easy part is these various whites items do not need to be the same white. In fact, it is trendier right now to mix whites (check out Plume POW: Whites Out Saturday for more on this trend). By mixing multiple whites, it gives outfits a more carefree feel, which is a nice mixed with the polish and put togetherness it also creates. Why not be polished, put together, trendy, and carefree? Then just add a subtle touch of a contrasting color to the sundress, and you have a fun yet polished play day outfit! Belt: I’ve had this for a while and am not sure of brand. I think it could be older Coldwater Creek? Consider the currently available SONOMA Goods for Life™ Leather Braided Women's Skinny Belt at Kohl’s, Wide Woven Leather Belt from Ann Tayler, or the Signature Women's Linen Braided Belt by L.L. Bean. Multi-Color Bracelet: Love Bracelet by Shine Chaser Jewelry which is no longer available, because I own it, but Dana currently has Festive Multi-Colored Faceted Agate Stretch Bracelet or you could likely commission something similar to mine. Run Around POW: Off to the Races Saturday on April 30, 2016. Outfit Mission Statement: For an effortless, preppy, horse-race-ready outfit choose modern takes on classic pieces, some mixing of prints, and the sophisticated combination of black and navy—plus a hat!